Summer is turning out to be the season for comedies in San Diego. Particularly at The Old Globe where this summer’s Shakespeare Festival is in full swing alongside productions on both of the indoor stages. But it’s the comedies in this mix that are seizing the day, and this weekend I was lucky enough to see the two best shows the company has this summer season. Perhaps the most satisfying surprise is the honestly funny production of Yasmina Reza’s God of Carnage, which just opened a little over a week ago. Reza’s worldwide success has largely rested on the advocacy and translation skills of Christopher Hampton who has brought the French language texts into the English language theater world. Critics have been divided on whether this was such a good thing and Reza’s comedies on social mores can come off as coldly clinical. 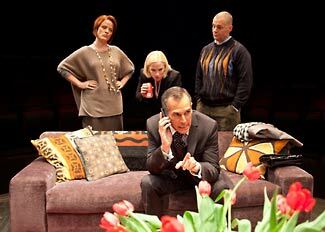 God of Carnage certainly felt like that in its original Broadway production that was later imported to Los Angeles with its four member cast of James Gandolfini, Hope Davis, Bill Pullman and Marcia Gay Harden all along for the ride. The Ahmanson sold seats right and left and people flocked to see TV and movie stars. 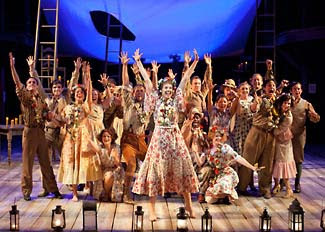 But despite the laughs and a few significant coups de theatre, that outing made the play feel like a French play being performed in English and acted out with a clinical detachment that left room for big star turns in the midst of a sort of wasteland. The Old Globe tapped Richard Seer to direct their revival for the White Theater and matched him up with a lovely cast including Erika Rolfsrud, T. Ryder Smith, Lucas Caleb Rooney, and Caitlin Muelder. And somewhere along the way these five artists managed to find a warm, human American comedy of manners among Hampton’s cold translation. Never once do these two couples, who have gathered to discuss the physical fight between their two young boys, come off as anything other than who they are billed to be. They aren’t so much characters as everyday Americans and they find and nail the real humor in the script that is just as easy to play as bitterness. The fact that the show also takes place in the round on the intimate White stage ups the ante for the show. This is not some modernist statement living room we’re watching, but a claustrophobic suburban upper-middle class one. The Old Globe’s excellent new production of God of Carnage gets to have it both ways with familiar logical laughs for the audience as well as the clever surprise moments that audiences have held onto to make the show a success. Meanwhile the comedy offered as part of this year’s Shakespeare Festival season is As You Like It in a staging under the guidance of festival director Adrian Noble. It’s a show that hits far more right notes than wrong ones with a big hearted Rosalind played by Dana Green. She grabs one scene after the next in this big magical Arden forest that is overflowing with lovers, fools and others. Noble keeps the tone light without plumbing for darker political meanings surrounding the usurping and banishment of Rosalind’s father the Duke. He’s moved the city scenes to the early 20th Century, but the forest scenes are a bit harder to place. Still it’s stylish and attractive and the pacing is fleet. Yet he lets the language breath without too much ponderous overstatement. Not everything is on target though. There are some awkward off-tone moments like the banishment scene that opens the play that evokes the deportation of Jews to Nazi concentration camps more than the banishment of a Duke. But these missteps are relatively few and while it makes no radical statements, Noble’s vision of As You Like It is the strongest offering of this year’s outdoor season in San Diego. The show runs through Sep 29th.